ONLY CARDINALS APPOINTED BY POPES Saint John Paul II AND Benedict XVI CAN DECLARE THE ELECTION OF FRANCIS THE MERCIFUL INVALID AND PROCEED TO A NEW CONCLAVE TO ELECT A LEGITIMATE SUCCESSOR TO Benedict XVI, PRAY AND WORK THAT IT MAY TAKE PLACE SOON . Is this what got Cardinal Pell into trouble? Could Francis be a Antipope even though the Majority of Cardinals claims he is Pope? Is it possible for someone to be a antipope even though the majority of cardinals claim he is pope? The case of Antipope Anacletus II proves that it is possible for a majority of cardinals to claim a man is pope while he, in reality, is a antipope. In 1130, a majority of cardinals voted for Cardinal Peter Pierleone to be pope. He called himself Anacletus II. He was proclaimed pope and ruled Rome for eight years by vote and consent of a absolute majority of the cardinals despite the fact he was a antipope. In 1130, just prior to the election of antipope Anacletus, a small minority of cardinals elected the real pope: Pope Innocent II. Again, how is this possible when the absolute majority of cardinals voted for Anacletus? 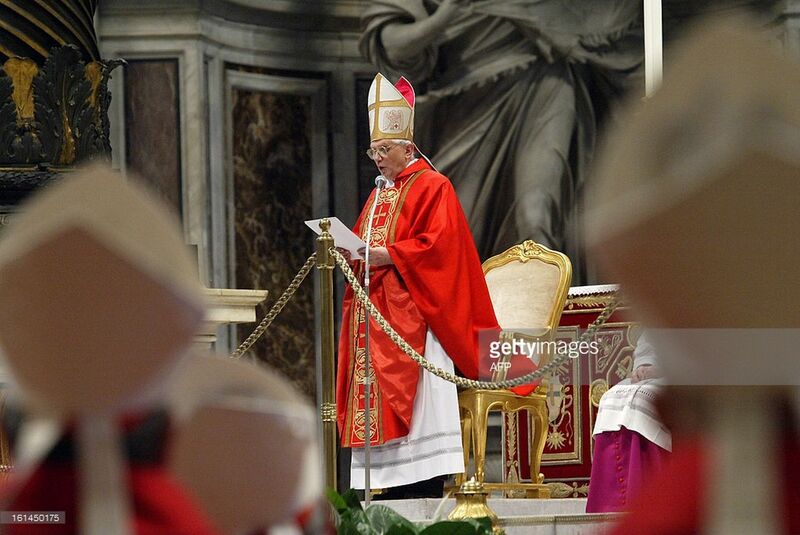 The majority or “sanior pars,” five cardinals out of eight of “the electoral commission,” elected Pope Innocent II as St. Bernard said and as evidence shows was the will of the previous pope in what we can call a constitution for the election of his successor. In the same way, is it possible that Francis was not elected pope even though he received a absolute majority of cardinals votes and is now as in the case of Anacletus proclaimed pope by the same absolute majority? As with the case of Anacletus, it is possible Francis is a antipope if his election contradicted or violated the constitution promulgated by Pope John Paul II for electing his successor. Bishop Rene Gracida, also, brings forward evidence that the conclave that elected Francis was invalid because there were “serious irregularities” against John Paul II’s constitution that governed the 2013 conclave. – “I further confirm, by my Apostlic authority, the duty of maintaining the strictest secrecy with regard to everything that directly or indirectly concerns the election process” [the above which Gracida clearly shows in his Open Letter was not maintained thus making the conclave and Francis’s papacy invalid according to the Bishop]. Later in the paragraph it says “except the act of the election,” which can be interpreted in a number of ways. The point is, as Bishop Gracida says and Universi Dominici Gregis said, only the cardinals can interpret its meaning, not Skojec, not canon lawyers or anyone else. The Bishop is saying what the document says: only the cardinals can interpret it. He, also, says put pressure on the cardinals to act and interpret it which both Skojec and Peters appear to prefer to ignore. Moreover, Bishop Gracida’s Open Letter and Pope John Paul II’s document make a number of points which neither Skojec, Peters or anyone else to my knowledge have even brought up or offered any counter argument against. I have great respect for both Skojec and Peters, but unless Gracida’s Open Letter is squarely responded to my respect for them will greatly diminish for they will be neglecting their responsibility to God and His Church. They are both wrong if they ignore this important Open Letter of Bishop Gracida. If Peters and Skojec as well as the conservative and traditional Catholic media are ignoring Bishop Gracida because he isn’t a cardinal and retired, remember that St. Athanasius wasn’t a cardinal (that is involved in the selection or election process of the pope of the time) and was retired. During the Arian heresy crisis, Pope Liberius excommunicated Athanasius. You don’t get any more retired than being excommunicated. Skojec gave blogger Ann Barnhardt’s analysis of the papal validity a long article and podcast. The only bishop in the world contesting Francis in a meaningful way deserves as much. Why is he apparently so afraid of Bishop Gracida? Skojec and Peters need to answer Gracida’s theologically clear and precise arguments and either clearly and precisely counter them or put pressure on the cardinals to put into action the needed canonical procedures to remove Francis if he was “never validly elected” the pope or else remove him from the Petrine office for heterodoxy. 2. a invalidly elected antipope who is a heretic. The point is whether you think using all the information available 1. is the objective truth or 2. is the objective truth you must act. You must as the Bishop says put: “pressure on the cardinals to act” whichever you think. There are many ways to put pressure such as pray and offer Masses for this intention, send the Gracida link to priests, bishops and cardinals, make signs and pray the rosary in front of their offices as we do in front of abortion clinics. Use your imagination to come up with other ideas. Gracida is calling the cardinals to “[a]ddress… [the] probable invalidity” before they attempt to depose him from the Petrine office for heterodoxy. But, just as importantly he is calling all faithful Catholics to act and not just bemoan Francis’s heresy. Remember that many who are calling those like Bishop Gracida, journalist Munguia and others “schismatics” for calling for a cardinal investigation are following in the footsteps of the real schismatics who promoted and followed Antipope Anacletus II. The schismatic followers of Antipope Anacletus II didn’t want St. Bernard to investigate who was the real pope. It was the followers of the real pontiff Pope Innocent II who asked Bernard to investigate. Why are so many traditional and conservative Catholics afraid of a cardinal investigation of the apparent “serious irregularities” against John Paul II’s constitution that governed the 2013 conclave that could invalidate the conclave which elected Francis? I have gotten some push back from someone about a bishop who attacked Bishop Gracida apparently using Robert Siscoe’s claim that it is an infallible dogma that a man is infallibly a pope if there is “peaceful and universal acceptance” by the Church. Was there peaceful and universal acceptance? In Siscoe’s own book “True or False Pope,” he mentions the following scholars who questioned the validity of Francis’s election: Vatican expert Antonio Socci and “Stefano Violin, esteemed Professor of Canon Law” (Page 390). And there is a bishop and many other scholars who question the validity not mentioned by him. Again, Bishop Gracida is saying what John Paul II’s conclave constitution says about the question of if Francis was “lawfully elected” or not: only the cardinals can interpret it, not Siscoe, Skojec, canon lawyers or John of St. Thomas. 3 Responses to ONLY CARDINALS APPOINTED BY POPES Saint John Paul II AND Benedict XVI CAN DECLARE THE ELECTION OF FRANCIS THE MERCIFUL INVALID AND PROCEED TO A NEW CONCLAVE TO ELECT A LEGITIMATE SUCCESSOR TO Benedict XVI, PRAY AND WORK THAT IT MAY TAKE PLACE SOON . The fact that the reasons marshalled above by Richard Stokes, as well as the specific considerations earlier brought forward by Emeritus Bishop Gracida, are utterly ignored and not addressed at all concerning this most important issue for the life of the Church are sufficient reasons to raise one’s suspicion that the Church, indeed, has been subjected to a horrible injustice and violated. No one who ignores these considerations merits respect if they deliberately ignore them and fail to respectfully address them. I trust Bishop Gracida and agree with his excellent commentary. Judging by what the Church is going through under Bergolio, and having been a Member of the Pontifical Academy for Life, appointed by St. John Paul II and dismissed by Bergolio, I hope and pray that the few faithful Cardinals will investigate and act accordingly to save the Catholic Church soon. Thank you Bishop Gracida for your valor. “Pray an Our Father now for the restoration of the Church and for Catholics to not just bemoan heresy, but put pressure on the cardinals to act as well as for the grace for a cardinal to stand up and investigate and to be the St. Bernard of our time. We have been praying the rosary. One bead is dedicated to just this issue and for Bishop Gracida’s strength to continue as he keeps sounding the alarm. But it is an easy thing to print out this blog entry with a note attached and mail it in to whomever is taking over for Cardinal DiNardo as he recuperates. Or should we mail it in to a different cardinal?